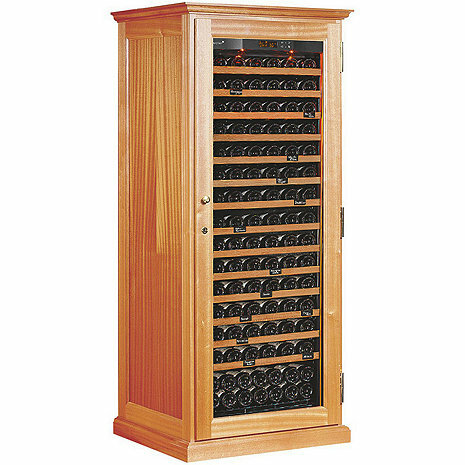 Furniture made by cabinet makers in solid oak or beech wood to house your wine cabinet. The ELITE cabinet range is the result of a partnership between EuroCave, inventor of the wine cabinet in 1975, and a three generation family-run business of expert craftsmen specializing in high end cabinetry. This EuroCave solid wood furniture will sit perfectly in any of your living areas, enhancing and adding character to your interior. The furniture is made to order and assembled with the cabinet (of your choice) at our factory located in the north of France. To ensure that your furniture blends seamlessly with your interior decor, you have the choice of 8 different shades. 7 different configuration options are available to suit your interior. For a warm, convivial atmosphere you can also opt for the bar module, specially designed to house your glasses and spirits. Furniture specially designed to perfectly house the Pure and Revelation ranges. Choose the cabinet that suits your requirements from: small or large models, in either maturing, serving or multi-temperature units with a choice of interior layout of shelves. In addition, the various Premium optional extras available give you even greater choice. Smooth Handling: By creating Revelation we wanted to offer a new generation interior layout, for improved ergonomics and ease to use. Sliding shelf with capacity for up to 12 bottles.